Last night was full of sirens, smoke, and explosions. Our little town was full of fire rescue personnel from all over the surrounding areas as a local fertilizer company burned entirely. 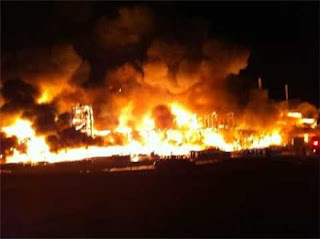 Our home is located very close to the scene of the accident, and we watched as the night sky glowed from the hot flames. We could feel the explosions in our home very much, and we waited to hear if we should dodge any toxic fumes. Surrounding homes were evacuated and workers at a company on our street were made to leave. We were not required to leave as of this morning, but there are officials all over town constantly checking air and water quaility. As of this morning, there were many unknowns as to the chemicals and possible toxins being emmited in our environment. Being less than three blocks from the fire, we are understandably concerned. With a baby on the way and a three-year old in our home, it made for a fitful night of sleep. We have been told that there were no known injuries which is a miraculous blessing. Seeing the sun come up this morning was an event. Our small town was dangling below thick, gray clouds of heavy smoke. I was thankful to be driving to work about 20 miles away. I am hoping to hear if it is safe to return home today, but until then, we are watching and waiting hoping we can trust the officals in this matter. To my knowledge, they were still battling flames this morning. From my home, I could only see smoke, so I am unusre if this is fact or not. This factory is located right on one of our beautiful lakes. So, there are concerns for land, air, and water toxins. Please pray that there will be no lasting effects, and we can feel safe and confident about our water and air at home. I'm glad you guys are ok. That's pretty scary.